There’s the piece that starts the conversation, and then there’s the striking workmanship, the overall atmosphere, that allows it to unfold from wall to wall, floor to ceiling. A captivating home design is the result of careful consideration and attention to detail. The spacious layout, the conversation pieces, the woodwork and intricate finishes—Avanti will make the estate home you’ve always imagined a beautiful reality. At last, you’ve found your ideal surroundings, quiet and scenic. Now it’s time to construct a home worthy of such splendor. Have you discovered the perfect location in the heart of the city? Let Avanti show you what’s possible with a custom infill design. Original character and timeless design shine through every Avanti home. With each project, we embrace new ideas, technologies and materials. Each room in your home should be as individual and personal as your spirit. Completely tailored to your tastes, yet anchored by functional elements that make living easy. 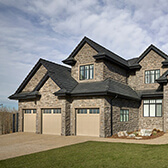 A stunning testament to our craftsmanship, our showhome is a point of pride. From design to construction through to the final décor, we truly provide the whole package.